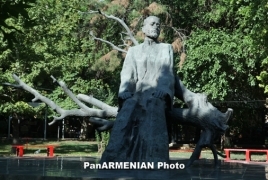 PanARMENIAN.Net - The 39th Session of the UNESCO General Conference held in Paris, France has decided to include the 150th anniversaries of Komitas and Hovhannes Tumanyan in the UNESCO Calendar of anniversaries of eminent personalities and important events of 2018-2019. The proposals on “The 150th anniversary of the birth of Soghomon Soghomonian, known as Gomitas Vardapet (1869-1935), composer, ethnomusicologist, researcher and singer” submitted by Armenia with the support of France and Germany, and “The 150th anniversary of the birth of Hovhannes Tumanian (1869-1923), poet, writer, translator” submitted by Armenia with the support of Georgia and Russia have been approved by the organization. It should be noted that since 1998, 23 anniversaries submitted by the Republic of Armenia have been included in the UNESCO Calendar of anniversaries of eminent personalities and important events.